Ready to host a Twitter chat? Do you want to improve your chances of success? Making sure you have a few basic building blocks in place will help you start your Twitter chat off with an audience that’s ready to participate. 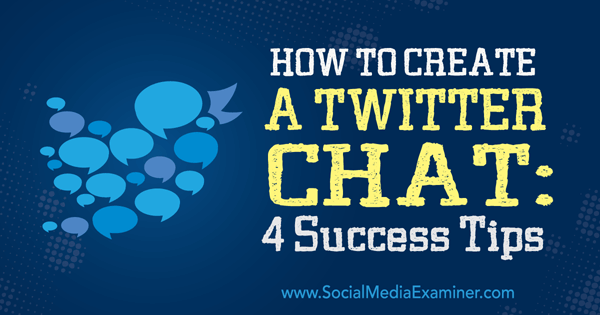 In this article you’ll discover four tips to help you start a successful Twitter chat. 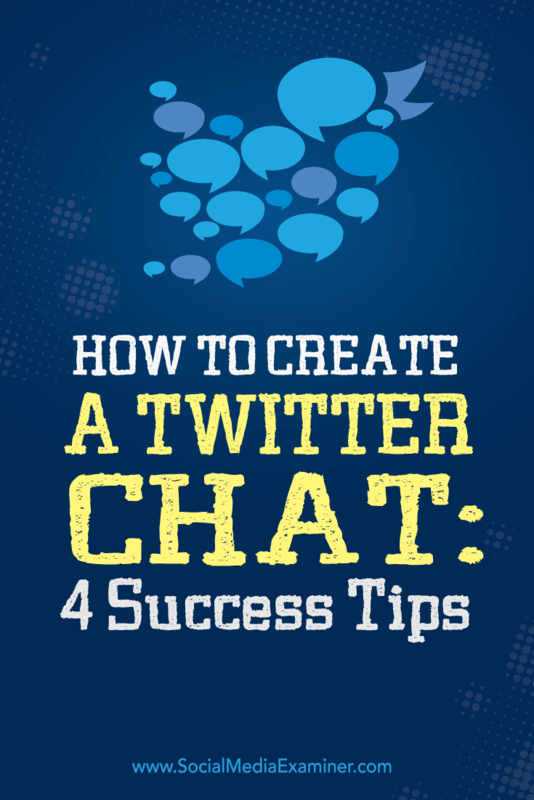 Discover four tips for successfully creating your first Twitter chat. If you want lots of people to show up, you need to schedule your Twitter chat at the optimal time for your audience. The more people who are available to chat, the greater your chances for engagement. Use a tool like Followerwonk to figure out when your followers are most active, so you’ll know the best time to host your chat. After you log in, click on the Analyze tab, enter your Twitter handle and click Do It. 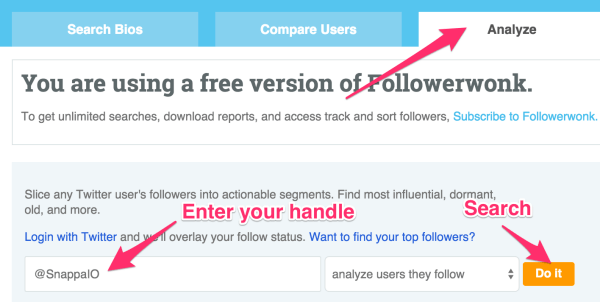 Enter your Twitter handle and click Do It to see an analysis of your followers. You’ll see an hourly breakdown of when your followers are most active. Look at the chart to discover the optimal times to host your Twitter chat and get the most engagement from your audience. There’s no point in hosting a chat when the majority of your followers aren’t online. In addition to knowing when your Twitter followers are most active, you’ll also want to take into account the times during which other popular chats are scheduled. To reduce scheduling conflicts, be sure to consult the Twitter chat schedule from TweetReports. This is a helpful resource which shows the times and days other popular Twitter chats are scheduled to take place. Checking this document will help you avoid scheduling your chat during the same time as another chat your audience (or you) might be interested in attending. Go to TweetReports to see when other popular Twitter chats are scheduled. You might also want to review the Twitter chat schedule from Twubs. It shows you an active list of upcoming Twitter chats. Look at a list of upcoming Twitter chats at Twubs. By consulting the schedules of other popular Twitter chats, you’ll ensure that your chat doesn’t conflict with them. That way you don’t run the risk of people not attending yours. If you’re just starting out, this can be very beneficial. To maximize your reach and overall engagement, make a point to invite special guests and relevant people to participate in your chat. For example, SEMrush invites special guests to their Twitter chats and sends direct tweets to influential people inviting them to participate. Invite special guests, experts and other relevant people to participate in your chat. You can identify influential people using Followerwonk. It allows you to find and connect with influencers in your niche, making it the perfect tool for finding relevant guests to join your Twitter chat. To identify influencers, click the Search Bios tab. Click the Search Bios tab to get started. Next, you will want to search for a keyword that is relevant to your niche or the topic of your chat. 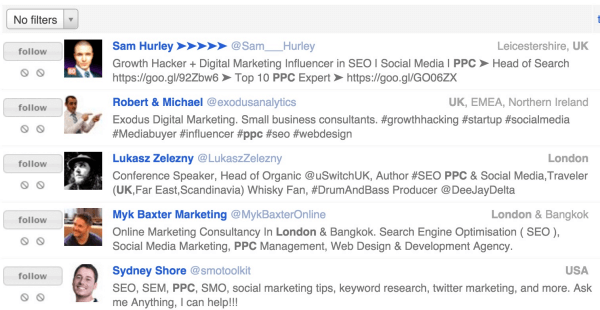 Enter your search term and select Search Twitter Profiles from the pop-up menu. If needed, click the More Options button to see more filtering options like location and minimum followers. Then click Do It. 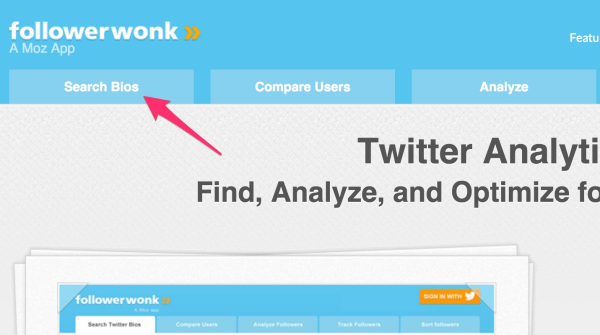 Followerwonk searches the profiles of other Twitter users for your keyword. Followerwonk shows you a list of relevant people for your topic of choice. View the results of your keyword search for influencers. All you have to do is decide which people you want to target from the list, and invite them to be special guests or ask them to participate in your chat. When you promote and run your own Twitter chat, you’ll want to get as much engagement as you can. Visual content might provide the extra boost you need to connect with your audience. 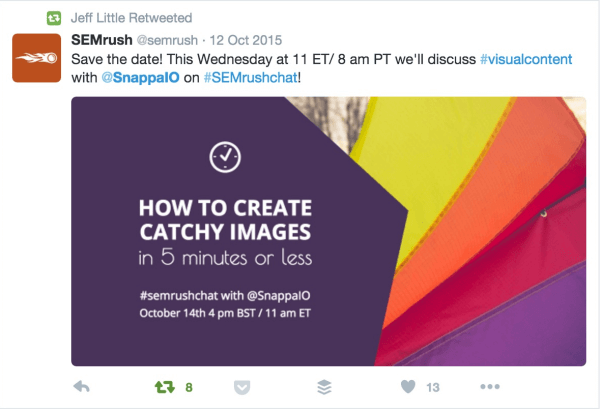 There are several ways you can incorporate visuals into your Twitter chats. You can use images to promote your upcoming chats, ask questions during the chat and recap answers to all of the questions that people asked during the chat. Promote your upcoming Twitter chat with eye-catching visuals. Pick an attractive color palette using a site like COLOURlovers. Ensure there’s adequate contrast between the background and text in your images. If you need help identifying contrasting colors, consult the Adobe Color Wheel. Use only one or two fonts per design. After you’ve laid the groundwork for your chat, it’s time to run it. While it’s possible to manage the chat by following the chat hashtag, that’s not the ideal approach. Instead, you’ll want to use a dedicated tool like TweetChat to manage your chat. TweetChat will add the hashtag of the chat to every reply for you. This saves you time and ensures you don’t forget to include the hashtag. This tool also automatically updates with the latest tweets in the conversation so you don’t have to keep refreshing your Twitter feed to follow along. To get started with TweetChat, enter your chat hashtag in the search box and click Go. Enter your chat hashtag on the TweetChat homepage. Once you’ve connected your Twitter account with TweetChat, you can easily manage your chat and follow the conversation. Manage your chat quickly and effectively with TweetChat. A tool like TweetChat makes it easy to manage your chat and lets you to stay on top of the conversation, engaging more users in real-time. Twitter chats are a great way to engage with your audience and grow your business. By using the steps outlined in this post, you’ll be on your way to hosting a successful chat, week in and week out. What do you think? Have you hosted a Twitter chat? If so, what tips can you offer? Please leave your thoughts in the comments below. Tips to create a successful Twitter chat. Christopher is the co-founder of Snappa, the easiest graphic design tool you’ll ever use. Connect with him on Twitter @cgimmer.